Folks, like many of you I go to work. The place where I give a day’s work for… get this.. a day’s pay! And in this struggle for a day’s pay through a day’s work I sometimes get… messages on the ol’ slack! I know that the moment that little pinging sound hits my damn ears… your main man Alex has got some work to do! And look, the stress of having to have a job might be scarier than any Dracula could ever be, which might be why this terrifying costume of a man dressed up as a Slack notification is giving people the gosh darn spookies! The costume, created by Twitter user @aengelbro, will bring up your most horrifying work nightmares as he comes, not only with a notification number that appears when you gaze peacefully at the Slack icon, but it also comes with a Slack sound effect, sure to dredge up your greatest work nightmares when you get asked to finish up a newly upcoming assignment on 4:50pm on a Friday just when you are ready to go see “A Star is Born” with your cool as hell boys! Scary! Stalk me not Slack Man, I fear you true, but I am a mere mortal, and you are the specter of endless work, here to swallow me up into your massive maw, masticating my bones in your hollow spirit spit! Oh vengeful Capitalist Demon! I beg of you! Let me see “A Star is Born” with the boys! Haunt me not o vile Slack Spirit! I shall do your bidding! But I beg of you! Upload no more files to edit! Leave me in peace vile beast! In peace leave me be! 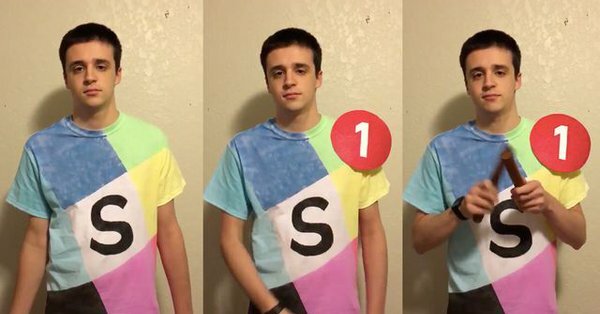 What do you think of this guy’s Slackstume? Let me know in the comments or on Twitter at @WhatsTrending, but if you let me know on Slack I will surely weep.